For those who absolutely love the Queen, you'll agree that Bohemian Rhapsody, the newly released Queen movie, was definitely a box office success following its second week in theaters. It received a lot of praise because of the film's accuracy in various aspects, and Rami Malek's performance as Freddie Mercury was top notch. While not all the details and storyline were complete replecas of their history, the one thing the film did get right was the iconic Live Aid show from 1985. So, let's dive straight into this unforgettable moment and let Rami Malek take us back in time to the days of Queen. Live Aid was an extensive project in 1985 which was organized by none other than Bob Geldof and Midge Ure. They aimed to help raise money to combat famine in Africa, specifically poverty-stricken areas such as Ethiopia. Musical acts from all around the globe connected for two joint concerts in London and Philadelphia, with Queen appearing during the day at the Wembley Stadium concert. David Bowie and U2's acts were indeed memorable performances, but Queen certainly stole the show with their dynamic shows that has lived on for over 30 years. These 20 minutes captured the band in top shape, which arguably represents the greatest live act in rock history till this very day and helped form a backbone for the film. Rami Malek had various interviews for the film, and we can imagine how much pressure he must have been under to make an accurate showing, as this was a task indeed! He stated that he had spent countless hours trying to perfect the Live Aid performance in the film and shared some details during an interview with News.com.au on the matter, saying, “That’s something we tried to get move for move, even just gesture for gesture perfectly." Malek even stated that he had the recording of the performance with him at all times during production, so he could get as much practice in as he could. Then he shared a bit more about the footage saying, “It felt like I had it in my bones and I didn’t want to keep going back to it. It felt like sometimes you would lose a little bit of the authenticity if you tried to nail it so perfectly." "Things won’t exactly always match up, there might be a hint of something that’s off, but I think that kept it feeling really alive and in the moment and it was better to sacrifice it that way, but yeah, I was watching it non-stop.” According to LADBible, Malek wasn't alone in trying to keep the production genuine. One fan tweeted after seeing the film saying, "Saw this earlier today, so awesome. First thing I did after the movie was check out how accurate the Pepsi and beer were on the piano... spot on." Other fans also joined in to marvel at the mastery of the production in the film, and after seeing the movie, they confirmed that the production was a complete success. We know how open fans are about airing their views, and their fan's eyes, according to LAD Bible, they were apparently shocked by the fantastic recreation of Malek'simitationn of Mercury, which they certainly didn't expect to hit off as well as it did. "These dudes were literally able to recreate the greatest live show ever performed and made a new generation be able to experience it as if they were actually there. This scene literally gave me the CHILLS. They did it precisely that I got confused which is the original and which is the remake. Omg not a sucker for him but daaaang this sure is historical!!!" Could you imagine having this kind of pressure on you while performing on stage? There are billions of fans who adored Mercury and the band, Queen. So, putting this task on someone's shoulders is undoubtedly one that would make any performer's knees quake with nerves. He was ready to deliver the performance of a lifetime. 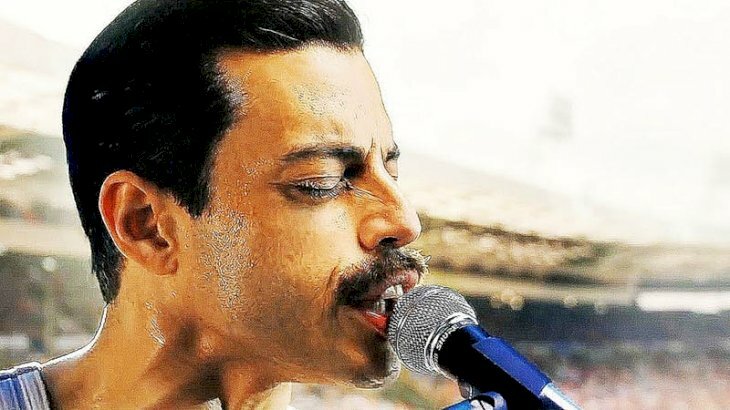 Malek told News.com.au that filming the iconic concert was "daunting", but a gratifying sign for the rest of the film by the end. He said, “We felt like, ‘OK, now that we have that in the bag we can do this, we’ll be all right,’” So keeping things positive surely helped them, and there was no time for cold feet or stage-fright either. Let alone mistakes as the fans were watching. While there were some details that were seemingly fudged up in the film when you compared it to the reported history, such as Mercury's diagnosis with AIDS coming in 1987, and not 1985 before the Live Aid concert, the film's take on the actual show is the main highlight of the movie, according to critics and fans. So, we guess they didn't get everything accurate when it came to the dates, but that's not what the fans were interested in, apparently. So, Malek and the rest of the cast and crew certainly had their hard work pay off on the big screen, pretty much as Queen did back in 1985. Even though they performed exceptionally well, it's genuinely hard to top the real thing if you watch it. They did, however, come close to replicating it, and we applaud them for succeeding in such an impossible task. The actor reportedly saw the original footage of Freddie's performance over 1500 times! Rami Malek has been getting rave reviews for his portrayal of Queen frontman, Freddie Mercury in Bohemian Rhapsody. But now his incredibly accurate Live Aid whowing in the film is blowing people away. When you watch it, you'll agree with the fans. Malek's production is so precise, that you could place them shot for shot together on separate screens. He unmistakably did his homework, and luckily for him, it paid off in the end. Malek was so keen on perfecting his act as Mercury that he watched the 1985 footage over 1500 times. By that time, we are sure he was thoroughly knowledgeable of every move and every facial expression that Freddie made back then. Just imagine the amount of work that had to go into memorizing the stage performances. Fans are so impressed that they're spreading the word online. Malek even managed to perfect Freddie's gestures on stage. On the left, you can see Freddie Mercury at Live Aid in 1985, and Rami Malek in Bohemian Rhapsody, 2018 on the right. The fans loved it so much that they are encouraging others to check out the original footage so they can see how accurate it really is. Thanks to their fantastic performance, they've impressed the world, and the Oscar buzz is definitely swirling. Have you seen Bohemian Rhapsody yet? If you haven't, what are you waiting for? We recommend you check out the original Live Aid concert beforehand and then compare the outstanding production of Malek afterward to get an idea why these fans are raving about it. We hope you enjoyed this insider to the legendary band, and remember to share this with your friends and family. Keep up-to-date with us for more exciting news on your favorite singers and legends of Rock. Before it is time to say goodbye, today we will recall some series that will release their final seasons in 2019. You will be dumbfounded to discover some unexpected TV shows on our list, so let's get started! While the Duke and Duchess of Sussex are splitting their household from Prince William and Kate's, reports have surfaced that they also wanted their own brand. However, the Queen refused. Let's find out why! When you become a part of the royal family, there are some customs that you just have to follow - whether you like it or not. Of course, traditions are passed down through generations. But, the Queen has made her own set of rules - no matter how senseless they are.